WILDERNESS – One of the Garden Route’s most notable events, the Thousand Sensations Craft Beer, Spirits & Food Festival, returns to Wilderness on 15 & 16 September. Hosted by The Wilderness Hotel, the popular annual festival features 170 handcrafted beers, presented by the 40 mostly local craft brewers that will be on hand at the fest. In addition, and for the first time, this year the festival also offers the anticipated crowd of more than 3,000 sensations seekers something a little stronger: craft spirits. 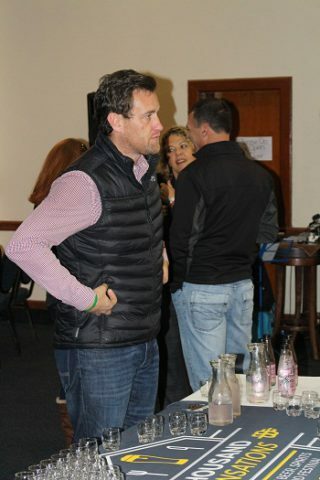 South Africa is experiencing an artisanal revolution on many fronts, and handcrafted spirits have not been left behind, which is why Thousand Sensations thought it apt to present 6 South African craft distilleries at the festival: Tapanga Rum, Six Dogs, Black Mountain, Fynbos, Posboom and Woodstock. Between them, the distilleries offer proudly South African spirits, locally distilled into premium whisky, gin and rum. Highlights include Tapanga Rum, from KwaZulu-Natal, makers of South Africa’s first premium Rhum Agricole, Six Dogs Distilleries from the valley of De Wet where their premium gin is made with wild botanicals native to their neighbourhood on the fringe of the Karoo, and Fynbos Distilleries’ products all the way from Stanford, including witblits, mampoer, liqueurs and husk spirits. With such empowered libations on hand, it is vital to fortify oneself and, as punters have come to expect, Thousand Sensations has craft food on the menu too. The Wilderness Hotel and 9 gourmet food stalls are tasked to keep the crowds well-fed and satisfied throughout the weekend. 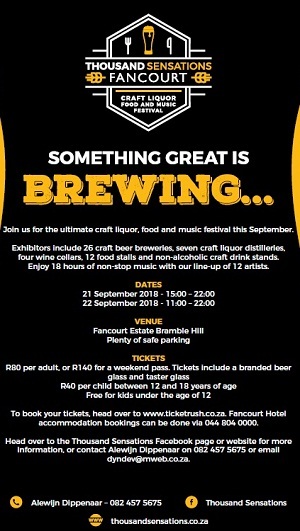 Entry to the festival is a mere R90 per person per day, and includes a 340ml branded tasting glass and a 500ml craft beer. For more information stay tuned to Thousand Sensation’s broadcasting partner Algoa FM, pick up a copy of print partner George Herald, or contact Alewijn Dippenaar on 082 457 5675 or via www.thousandsensations.co.za, or facebook Thousand Sensations.